The United States has raised tensions further amid Syria&apos;s ongoing conflict. It has issued a threat in the form of a "warning" against Damascus against retaking the northern region of Idlib. More specifically, the US has accused Damascus of preparing chemical weapon attacks as part of its alleged strategy to retake the territory. No evidence has been provided by the US to substantiate these accusations - and it is clear that the warning was actually a threat implicating a planned, staged provocation likely to be followed by US military aggression. It is home to Al Qaeda affiliates, partners, and allies including Tahrir al-Sham - formally Jabhat Al Nusra, a US State Department-listed Foreign Terrorist Organization, Nour al-Din al-Zenki - a US-armed and backed military front notorious for its many war atrocities involving torture and executions including the beheading of a child, and Ahrar al-Sham which has repeatedly cooperated with the self-proclaimed "Islamic State in Syria and Iraq" (ISIS). The nature of the militants occupying Idlib is well known to Washington, London, Brussels, and the Persian Gulf nations sponsoring them. It is because of this knowledge that the West&apos;s media monopolies work feverishly to cover up, deny, defend, or even excuse their atrocities. ...he appears to be as young as 10, although other reports suggest he is considerably older. BBC&apos;s defense of war atrocities committed by terrorist organizations occupying Syrian territory is the rule, not the exception - not just for British state broadcaster BBC, but the Western media as a whole. From the beginning of the 2011 conflict, the BBC and others have played a direct role in covering up the terrorist affiliations of fighters attempting to overthrow the Syrian government. Idlib remains one of the last remaining strongholds of Al Qaeda in Syria specifically because of its proximity to the Turkish border - Turkey being a NATO member who has provided years of financial, political, and military support to militants operating in Syria. Idlib has been - since it fell to foreign-sponsored terrorists - so dangerous that much of the governorate is inaccessible to the Western media and Western organizations sending aid to groups occupying it. 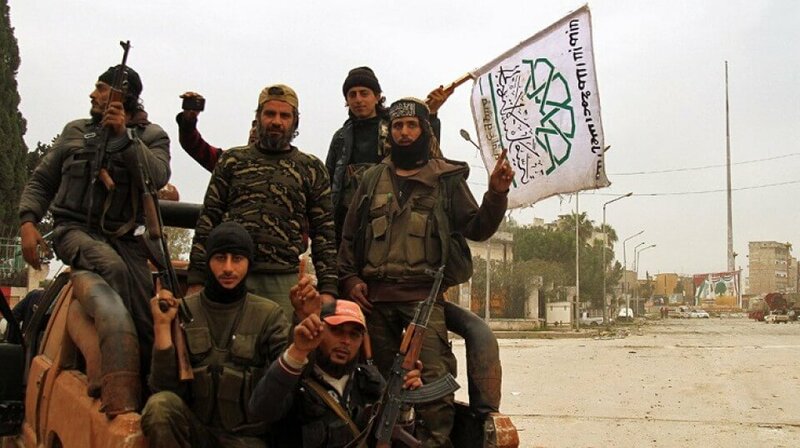 With extremists more recently uprooted from around Damascus and the southern city of Daraa sent to Idlib, the concentration of "entrepreneurial criminals" and "some of the groups" referenced by the Century Foundation has only risen. The report also makes mention of the now notorious "White Helmets" and the now defunded and exposed "Free Police:"
While the West has doubled down on its support for the "White Helmets" despite extensive evidence linking them directly to Al Qaeda, the so-called "Syrian Free Police" have already been defunded. From the actual militant groups occupying Idlib, to the administrative networks attempting to run the region - it is clear extremism now holds the population hostage and does so specifically because of Western aid the West&apos;s own think tanks have exposed as ending up directly and exclusively in the hands of terrorists. Idlib is thus every bit an "Islamic State" in practice as ISIS was in Raqqa, Syria and Mosul, Iraq - and an "Islamic State" made possible by extensive and fully conscious Western sponsorship. Thus it is not Russian propaganda or a public relations office in Damascus exposing those occupying Idlib as terrorists or the necessity for Syrian forces to liberate the region - it is the Western media through their own incremental admissions made discretely beneath headlines and op-eds like the New York Times&apos; recent piece titled, "The Death Blow Is Coming for Syrian Democracy"
But if "the supposed democratic powers" who engineered Syria&apos;s 2011 conflict and propped up the opposition in Idlib ever since don&apos;t really care about "democratic alternatives," they probably weren&apos;t really "democratic powers" to begin with. Their interests in Syria were completely unrelated and merely obfuscated by "humanitarian" and "democratic" concerns, and the entire supposed "revolution" merely an obfuscation for Western-backed regime change in pursuit of regional and global hegemony. The so-called "opposition" does not really exist as a functional, relevant factor in Syria&apos;s conflict and never did. It was a superficiality necessary to dress the windows of Western-backed, violent regime change pursued with equally violent, ruthless terrorist organizations. With the eviction of terrorists from Idlib complete, Syrian forces and their Russian and Iranian allies will have only a tenuous US occupation in eastern Syria and Turkey to the north to contend with. Attempts to portray Idlib as a bastion of democracy, the Syrian government as a ruthless dictatorship "terrorizing" the population when in reality it is eliminating militants both the West and Damascus agree are actual terrorists - all constitute similar attempts at window dressing what is otherwise a very clear and concise battle - one between a sovereign nation defending and liberating its territory, and the proxies of a foreign invasion that have plagued Syria since 2011.